Gardening does not have to be all about growing plants. There are times and places where plants cannot be used due to drought conditions, cost or simply a dry climate. Or it could be that there is no time for garden maintenance. So how can the back yard be made to look attractive without using annuals and other high maintenance plants? A dry creek bed – dried up stream – may be just the answer. Think of a dry creek bed in nature; there will be small and large rocks, pebbles, river sand, grasses of different kinds and perhaps ferns. There could be a mossy log or piece of driftwood. Native trees and shrubs are likely to be growing around the edges. There might even be a rustic bridge of some kind. Ferns and grasses would drift down a bank. 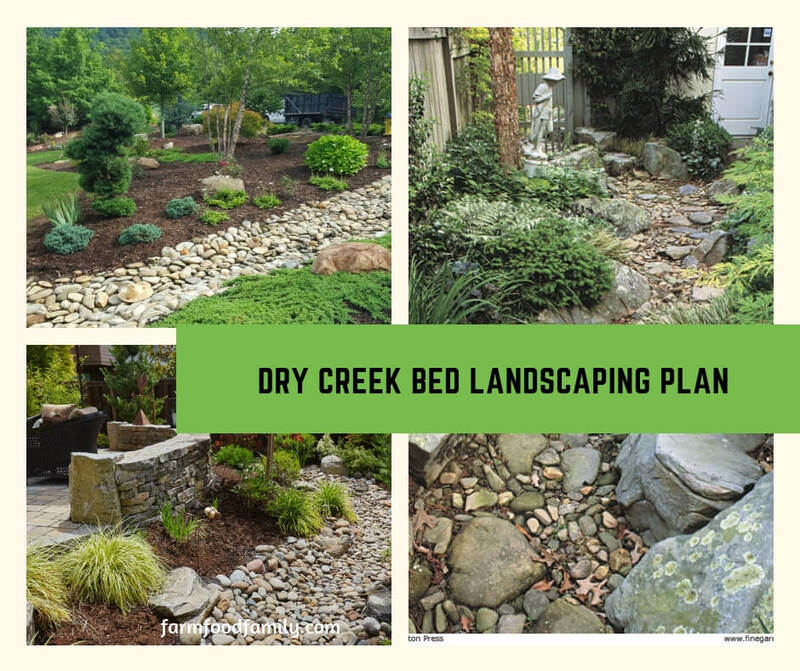 Making an area that looks like a dry creek bed is easy and can be almost free of cost if there is access to such things as gravel and rocks. Of course, even a small budget will enhance the looks considerably. The best thing about it is that whatever is bought to make a dry creek bed project will not die and need replacement like many plants do. So what needs to be done? Use a hose or rope to outline the edges for the best effect. This can be changed from one place to another until a firm decision as to site has been made. It can be removed as the project progresses. Rake out a shallow shape in the yard where the dry creek bed is to go. The shape should emulate that of a stream, so it will need to be rather longer than it is wide. But the shape will be partly dictated by your block of land. Once the best position and shape has been decided on, place black plastic to fit and poke a few drainage holes through at the lowest part so it will not become a pond when it rains. Cover the plastic with a mix of river sand, small and larger pebbles and rocks. Add a small wooden bridge if liked, or some driftwood collected on a trip. Place the sand and pebbles in drifts rather than just scattering them anyhow. If possible take a look at a stream in the natural and envisage how it would look without water. A bank could be made by heaping up earth under the plastic and then over the top. A few rocks over or around it will create a more natural effect, especially if natural grasses are left to grow around them. Some plants may be used for this project if wished. A few grasses or ferns at the edges will aid a soft and natural look. These need not be native grasses, though naturally those would grow well in the area. But using ornamental grasses as well will add a touch of graceful elegance that is likely to be missing in the natural setting. A few other hardy perennials will also enhance the look of the area. But remember the whole idea of creating this unusual feature is low maintenance so be careful in your choice. A pot holding a rambling vine may look attractive near to the bridge or just at the side of the creek bed. A little wisp of greenery clambering around those bridge rails, or over a log will relieve and soften the browns and ochres of natural rock – especially if it flowers sometime through the season. When choosing grasses, make sure they are not the kind that tend to invade the place or problems of keeping them under control will occur. These can be grown in pots and the pot hidden behind rocks. A solar fountain will add a cool touch to your landscaped area, but if there is no water to spare then adding a few statues can give more interest and appeal. A native bird, a stone lantern or a few rabbits or ducks hidden amongst the grass or stones will surprise and delight visitors to the area. If there is to be a shady tree or shrub nearby, adding a rustic timber seat will encourage people to linger. Bird baths or feeders may also be added. In fact, any additions that are desired will help to make this area unique. However, try and keep to one theme for a look of unity. An elegant bird statue would not look too good next to a jolly gnome. Signposts can add interest and humor to your dry stream area. For instance, if you have a small bridge or log, a sign proclaiming, “Gnomes Cross Here” would make visitors smile. “Beware of Crocs” could be another humorous addition – especially if a crocodile statue was added. The details of such a project need only be limited by the imagination.